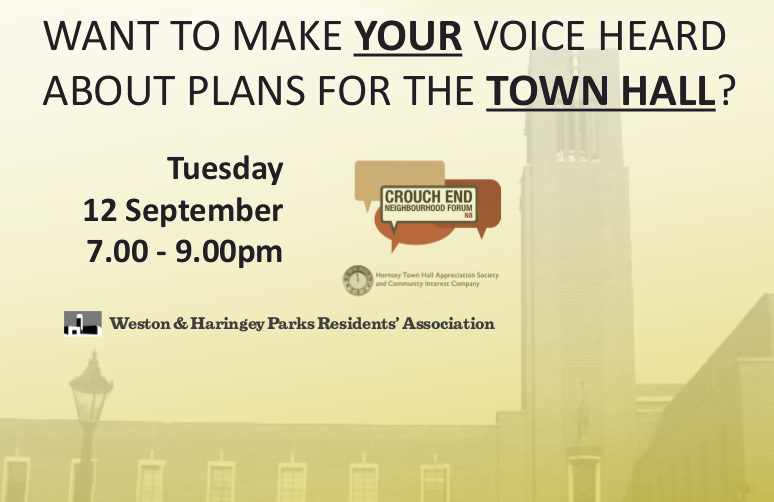 WANT TO MAKE YOUR VOICE HEARD ABOUT PLANS FOR THE TOWN HALL? So do Crouch End Neighbourhood Forum, Crouch End Festival, Hornsey Town Hall Appreciation Society and Weston and Haringey Park Residents Association and many others in Crouch End. Come to our public meeting to find out more about the planning application and how you can best comment on, object to or support the application. To assist with determining numbers, please do register for a ticket through Eventbrite. Making a valid comment on a planning application as complex as this is hard. 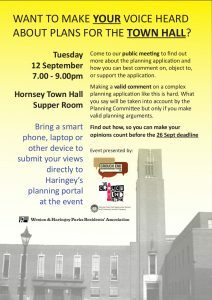 What you say will be taken into account by the planning committee but only if you make valid planning arguments. Find out how, so you can make your opinions count before the deadline of 26 Sept.
Bring a smart phone, laptop or other device so you can submit your views to Haringey’s planning portal at the event. The Neighbourhood Forum will be posting a response to the planning application shortly. For further info about the planning application see Crouch End Under Construction!